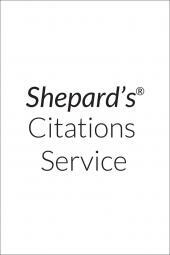 For over 100 years, Shepard's Citations has been a cornerstone of the legal research process. Generations of lawyers have Shepardized to retrieve comprehensive lists of cases and other sources that have cited their case or statute. And they have Shepardized to validate their authorities. Shepard's Bankruptcy Citations gathers all the pertinent references you need in one easy-to-use source.